Don't break your budget; the cost of web hosting has never been lower! We have gathered the cheapest hosting plans available, and ranked them according to price, service level, reliability and customer reviews. Get your blog or small business website online for less than the price of a cup of coffee today! In order to provide hosting services which are affordable, web hosting companies offer the opportunity to host your website on a Shared Server. Due to the inherent low cost, this is typically known as 'Cheap Web Hosting', and the ideal solution for those looking to get a professional website online within a tight budget. Primarily, Cheap Hosting is intended for smaller websites (generally defined as those with less than 100 pages, 500 pictures and 2000 visitors per month). A huge benefit of Cheap Hosting is it gives you the opportunity to test your site without spending heavily - the hosting provider will help you to upgrade when your site is close to exceeding the limits of your plan. Cheap Webhosting, or Shared Server Hosting? Refers to multiple websites sharing between them a single server and its resources, such as storage space and bandwidth. 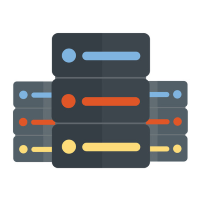 As the costs of buying and maintaining the machine is split between sometimes 100s of people, this is by far the cheapest web hosting service available. Who is Cheap Webhosting for? Anyone - whether you are a total technophobe, thrifty web developer, or something in between! Cheap Hosting is ideal for many purposes; you can open an online shop, start a blog, promote a non-profit organisation, and a lot more besides - the World Wide Web is your oyster. Even if you just want to have a website on your CV to help you in your job search, this is the perfect place to start. Pick a plan and Get Hosting today! Cheap Webhosting can also be good hosting! Despite its low price, Cheap Hosting is a perfectly acceptable solution that affordably meets the requirements of most without needing to compromise on quality. In particular, the budget web hosting companies displayed above offer excellent storage capacity, security and value for money. When the World Wide Web opened to the public in 1991, most websites were hosted on their own web servers. This was expensive and there was no way for somebody to get their business online without a thorough technical knowledge. To provide for this need, cheap web hosting companies rent out portions of their virtual server space, enabling them to handle the setup and maintenance on behalf of the user. Bluehost were among the pioneers, having been founded in 1996, while Hostgator began in 2002. Today, shared hosting is the most widely offered hosting service, mainly in response to ever increasing demand from small businesses and blog writers looking for a platform to give them visibility online. Why is Cheap Webhosting so affordable? A web server can host hundreds, or even thousands, of websites as long as it has the necessary hardware and bandwidth to accommodate Internet traffic to and from the websites that reside in it. This system works, as long as the web hosting provider doesn't try to accommodate more websites than its shared server is capable of handling. Which is why only the most reliable, legitimate and respected web hosting providers are listed here on Web Hosting Search. Typically, once you have signed up to your chosen hosting service, you will be given the information you need in order to log into your website's control panel. This can be used to manage certain aspects of your site. You should also expect to receive promptly the additional services which were promised, such as a domain, email account, website builder etc. Most Cheap Web Hosting providers will handle most of the setup for you and the majority of people go through the whole process with little to no trouble, enabling them to focus completely on creating the best website they possibly can. I hosted my wedding website with eHost and they have been really good, I am new to all of this so was really grateful to their support team who helped me from getting the right domain to installing WordPress and using the basics of the site builder. Depending on the provider, you can also get a lot of extras at no further cost, such as security features, site monitoring, traffic reports and advertising credits. Is Cheap Webhosting right for me? Even if you’re anticipating that your site will grow soon, Shared Server Hosting is still a sensible place to start. Your web hosting provider should be able to help you upgrade to Virtual Private Server (VPS) or Dedicated Server Web Hosting if your Shared Server plan becomes inadequate for your needs. Get your Cheap Web Hosting plan today!